. Legends about laquer . First some general remarks about lacquer techniques. Laquerware is created from the sap of the lacquer tree for practical and artistic equipment we use in our daily lives. The advantage of lacquer is its strong natural adhesive property and it is very easily processed into pieces. Traditionally many coatings of lacquer are applied and after drying patterns are carved out of the lacquer. Lacquerware manufacturing in Echizen is one of the traditional industries in Japan, and its history dates back over 1,500 years . . .
. . . CLICK here for Photos of Laquer Daruma ! The term lacquer originates from the Portuguese word for lac, a type of resin excreted from certain insects. Regardless, in modern usage, lac-based varnishes are referred to as shellac, while lacquer refers to other polymers dissolved in volatile organic compounds (VOCs), such as nitrocellulose, and later acrylic compounds dissolved in lacquer thinner, a mixture of several solvents typically containing butyl acetate and xylene or toluene. While both lacquer and shellac are traditional finishes, lacquer is more durable than shellac. Just as "China" is a common name for Chinese ceramic, "Japan" is an old name for Japanese Lacquerware (made from the sap of the Lacquer Tree) and its European imitations. As Asian and Indian lacquer work became popular in England, France, the Netherlands, and Spain in the 17th century the Europeans developed imitations that were effectively a different technique of lacquering. The European technique, which is used on furniture and other objects, uses varnishes that have a resin base similar to shellac. The technique, which became known as japanning, involves applying several coats of varnish which are each heat-dried and polished. In the 18th Century this type of lacquering gained a large popular following. 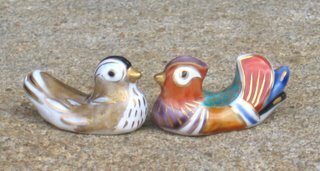 In the 19th and 20th Centuries this lacquering technique evolved into the handicraft of decoupage. 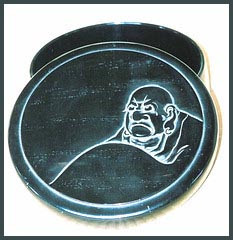 A lacquer plate called "Daruma Plate"
Used to serve sweet Japanese cakes for the Tea Ceremony. 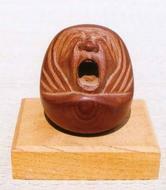 Seated Daruma, wood with a lacquer coating. the patina and the slight dulling of the red lacquer, we believe this piece dates from the late Meiji to Taisho period. enveloped in his robe, and they are hand carved to show facial and robe details. As you can see from the photos, each face is slightly different. The backs of all five pieces are covered in black lacquer, and the remnants of an old paper label can be found on each piece. They are to be ordered online for 2000 Yen. Daruma san in this item, really, trampling on his face! 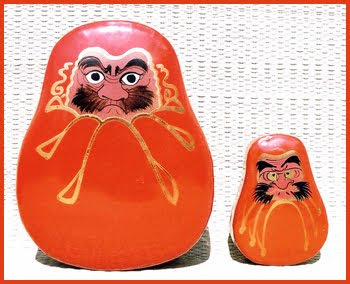 Now let us look at the other Daruma of Lacquer in my collection of the PHOTO ALBUM. is my first Daruma acquisition ever, read about him here. We go quite a while together. On picture 03 you can see him with some friends sitting in my office, always watching, always ready for a joke, always seriously happy! shows a small tray used in a temple to put on a flower vase (kadai). 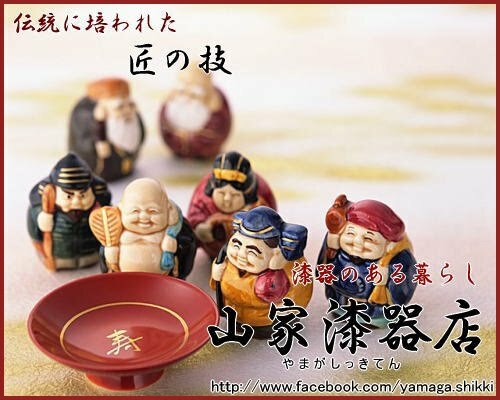 It is made of wood with Washuuzan-Laquer from Okayama prefecture. is a small bowl for soup. Probably red Negoro lacquer. shows two boxes, Father and Son (oyako) as I call them. Red Lacquer with gilt painting. The bigger one might have been used to store some lunch. a box of about 35 cm diameter, wood with a black lacquer coating. These kinds of boxes (cha-bako) are used to keep the tea utensils in, ready for use any time. is a very special plate of black lacquer with metal inlay of various patterns of a Japanese festival in Kyoto. The diameter is 12 cm. has captivated many people with its beauty. Decorated with simple, delicate designs and vividly elegant colors, it has gained popularity both inside and outside of Japan. The history of Takaoka lacquerware goes back as far as that of Takaoka City itself. When the second Kaga clan lord, Maeda Toshinaga, built Takaoka Castle and established what is now Takaoka City around 1609, he invited craftsmen from throughout the country to his domain, and had them produce various key necessities from armories to cabinets. This is said to have been the origin of Takaoka lacquerware. Starting out as a townspeople’s craft, by the late 18th century, Takaoka Lacquerware was beginning to be influenced by over-glazing methods from China, including tsuishu (the over-glazing of red lacquerware) and tsuikoku (the over-glazing of black lacquerware), and the region saw the start of production of trays and jubako multi-tiered food boxes. Techniques developed such as chokoku-nuri (sculpture painting), where artisans would literally paint lacquer onto sculptures, and sabi-e (rust paintings) that use sabi urushi (rust lacquer) to paint subjects three-dimensionally. Takaoka expanded as a production center and became known nationwide. 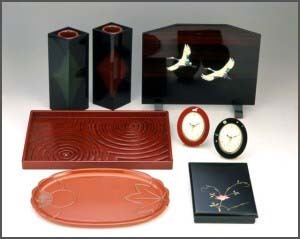 Building on these techniques, various products such as trays, tea utensils and furniture were manufactured, and in 1975, Takaoka lacquerware was designated as a traditional craft by the Japanese government. Other lacquer techniques representative of Takaoka are yusuke-nuri and aogai-nuri. Yusuke-nuri is a comprehensive technique that uses a Chinese designs as its base, with singular subjects or combinations of subjects such as flowers and birds, mountains and water, or human figures painted using the sabi-e technique. Decorations are then added to this foundation using coral and gold or silver sheets. Aogai-nuri, meanwhile, uses inlaid mother-of-pearl to create its designs. By using thin, hand-crafted shells, the foundation becomes transparent, illuminating a beautiful shade of blue. Takaoka lacquerware continues to be made to this day. Classic products such as trays and hand mirrors are still being manufactured, as well as new products that cater to modern needs, such as smartphone cases and piercings. Ancient or modern, investing in the dignified beauty of Takaoka lacquerware can bring an inspiring change to your life.
. Toyama Folk Art - 富山県 . Designs produced by the Japanese lacquer Master Uzawa Shogetsu seem to grow out of smooth surfaces of the perfectly finished lacquer boxes and other items he produced. Shogetsu’s (probably 1877 - ?) specialty were subtly shaded lacquer (maki-e) decorations, painted in meticulous details. With 26 items, the majority of works of this little known master is found today in the Collections Baur. Some of the objects were especially made to order for the collector Alfred Baur (1866 - 1951), who bought as many of Shogetsu’s objects as were available. As a consequence of Baur’s passion for this artist’s work, Shogetsu is comparatively unknown in Japan today. 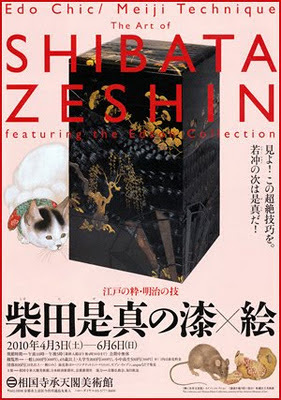 Various Tables, Glossary, and Notes.
. Shibata Zeshin 柴田是真 .
. Maki-e, makie 蒔絵 lacquer pictures . 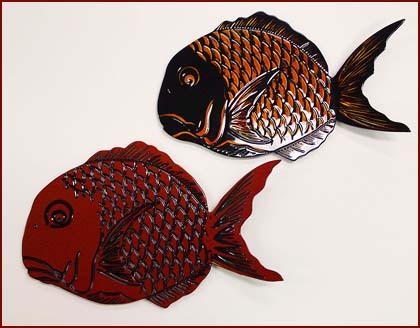 the makie-shi 蒔絵師（まきえし）applied the images.
. Edo shikki 江戸漆器　Edo lacquerware . The second Chinese character is for deer (shika 鹿). The wooden core was carved using only the blade of a lathe, and the piece utilizes the effects of this carving as a part of its ornamentation. The shape of the bowl is very elegant and solid. The edge has thick hemp cloth pasted on to improve its durability, and the artist has taken advantage of the texture of this cloth when adding the bowl's ornamentation. The more you use such a piece, the more you will appreciate the beauty and charm of this lacquered bowl. 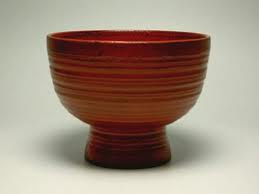 There are bowls for rice and for soup.
. Kobayashi Issa 小林一茶 - Introduction .
. shikki 漆器 laquerware, laquer ware .
. koogei, kôgei　工藝　/ 工芸 Kogei, industrial art .